Upgradeable Work Machine. 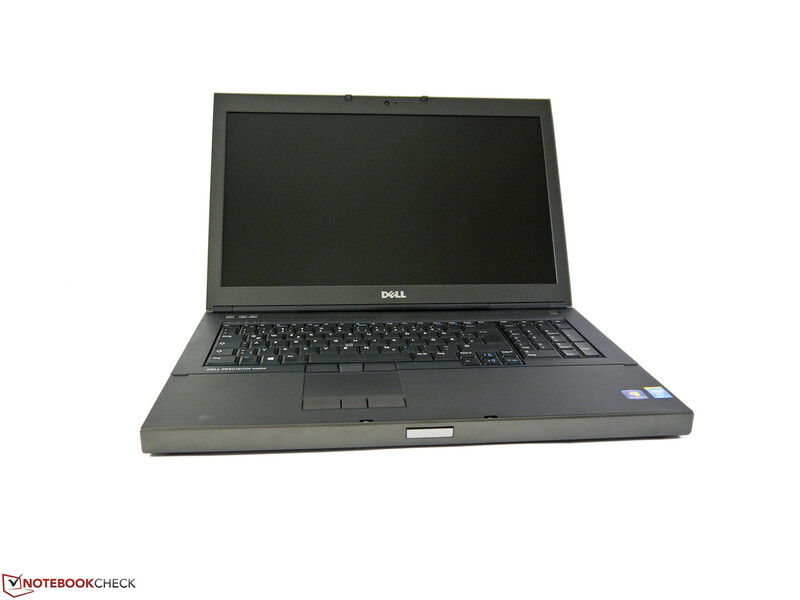 This large 17-inch Dell workstation is well-equipped and offers plenty of space for further customization. 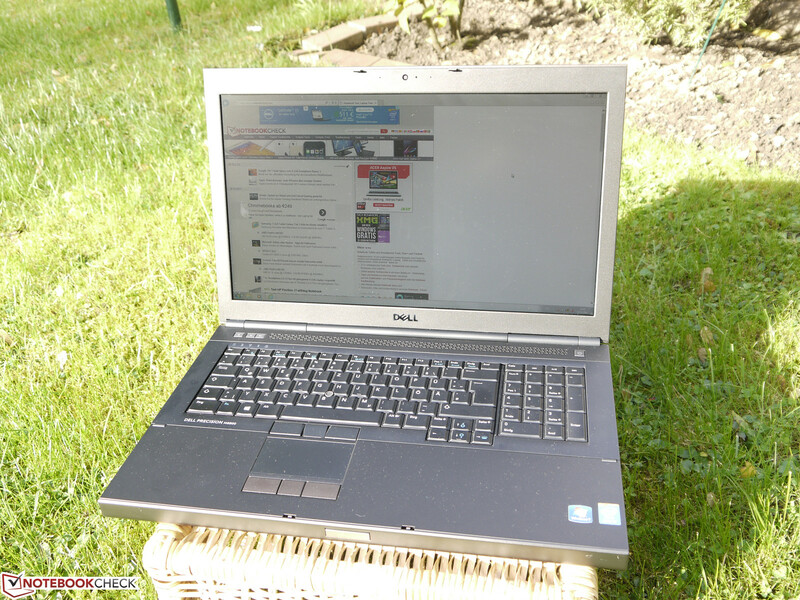 But is it enough to compete with the smaller Dell Precision M4800? Find out in our in-depth review. Dell is a heavyweight in the workstation market. In the last few years, the Precision series has always delivered high performance combined with low emissions. 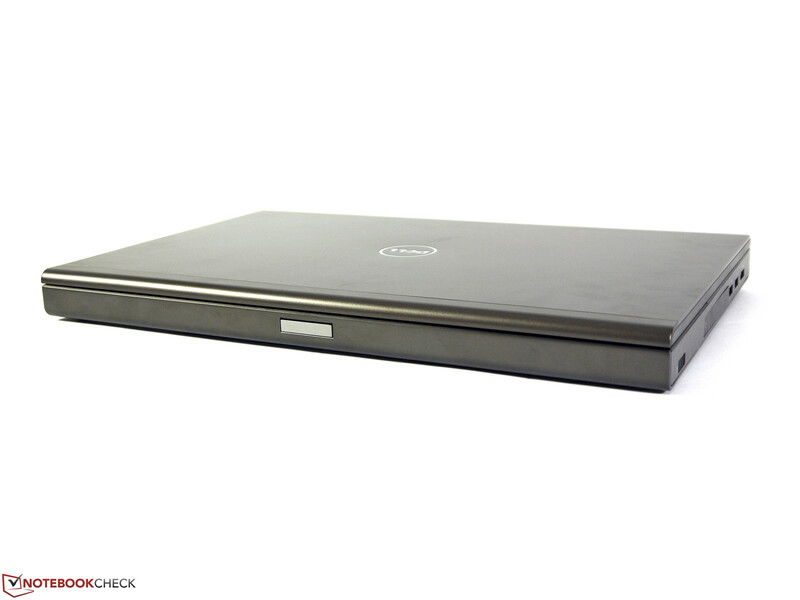 Buyers no longer have to worry about the basic qualities a work notebook should have when they purchase from Dell: high workmanship quality, a sturdy case, extensive service and upgrade options and typical business features. In short, you can find all you need in a Precision, but sometimes you have to pay a little more for it. Business customers and large firms can individually configure their models and even express any extra wishes they might have. However, the options available to private buyers are severely limited, as we experienced when getting out test model. 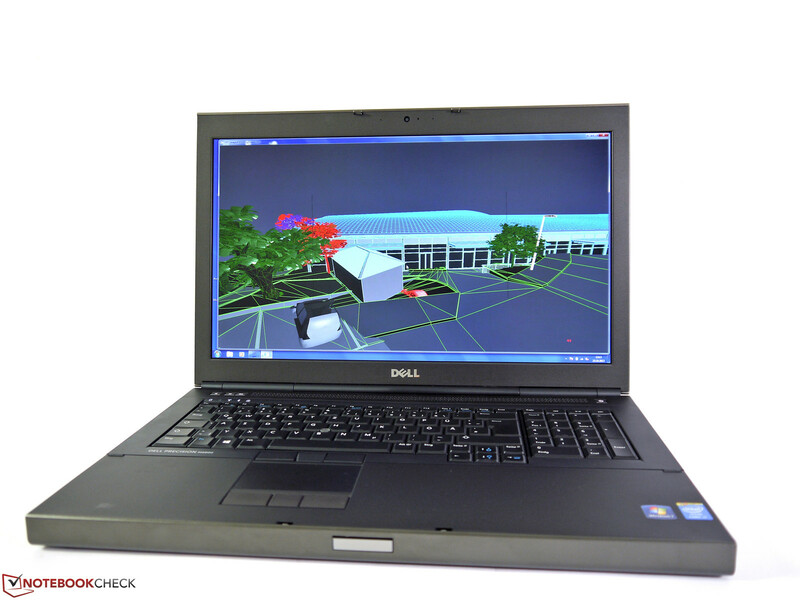 Dell instead offers pre-configured models that cover the needs of what most buyers want. As a buyer, you currently choose from three Precision M6800 configurations. It is possible to fine-tune some of the software, the warranty period and the service packets, but on the hardware side the user has to stick to the preset configuration. As such, other storage devices, RAM or similar changes are not an option, unless you do it yourself. At the time of purchase, our test model cost 2,030 Euros (~$2727) (total: 2,420 Euros/~$3251) and it includes an Intel Core i7-4800MQ-CPU, a 750 GB HDD, the Nvidia Quadro K3100M graphics, 16 GB RAM, a matte Full HD display and Windows 7. In contrast to the Dell Precision M4800, the large 17-inch workstation on our test bench is built around the familiar base case (now in its 4th generation). 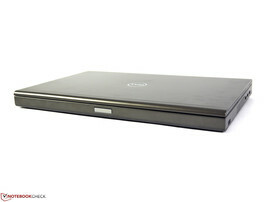 Over time, the ports may have been rearranged or some details on the inside may have changed, but overall Dell has stayed true to their original design. Sturdiness and user-friendly maintenance are at a very high level and ensure that the Precision M6800 scores full points in the maintenance test. A disadvantage of the sturdy, yet large case is its weight: 3.8 kg (~8.4 pounds) is not light. Furthermore, the model measures 41 x 27 cm (~16.1 x 10.6 inches) and requires a slightly bigger notebook bag than one is used to. ... in its 4th generation. 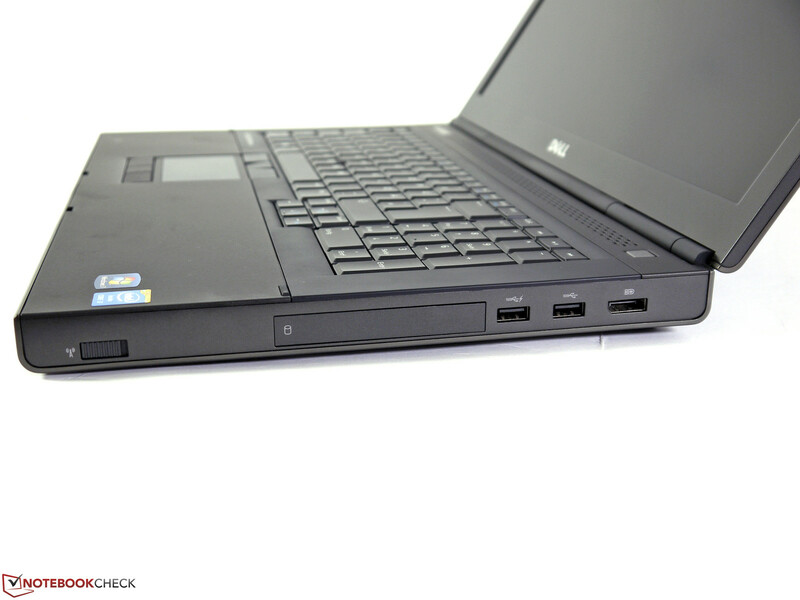 The ports placed on the sides and on the back of our test model are identical to those on the Dell Precision M4800. In fact, it seems that even the positioning has been kept the same. 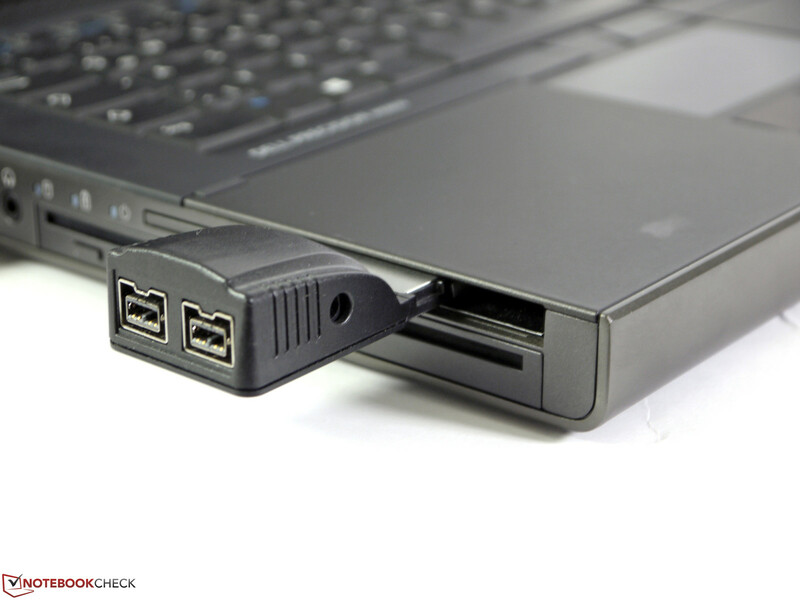 We are provided with 4 x USB 3.0, 1 x USB 2.0/ eSATA, HDMI, VGA, DisplayPort, card reader and Gigabit-LAN. 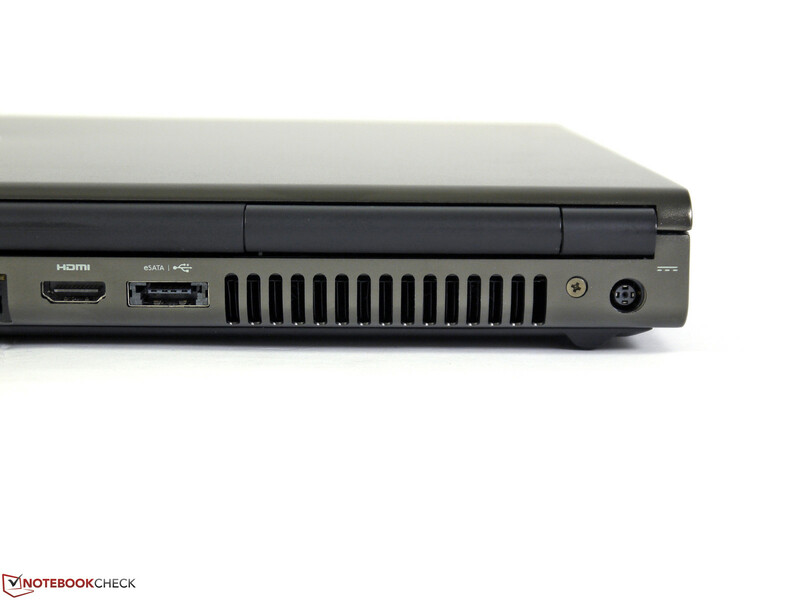 The Dell Precision M6700 has a FireWire 800 interface, but this is not to be found on our model. Unfortunately, despite the reduction in connectivity, the manufacturer has not optimally utilized the (now larger) space available for ports on the left side. For example, the USB 3.0 ports and the audio jacks are quite close together, which means the use of thick DVB-T, memory or WWAN sticks will block the neighboring ports (or they are harder to access). 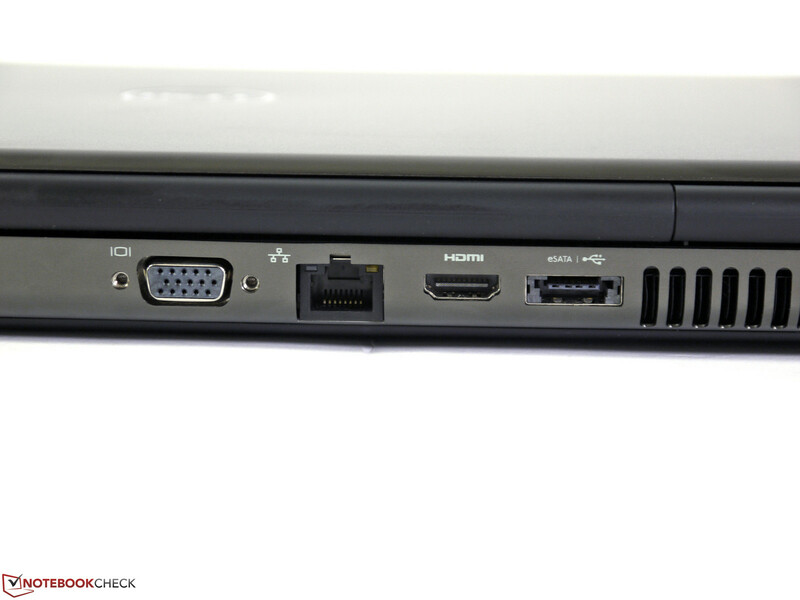 Additional ports can be procured using the ExpressCard 34/54 slot or via a docking station. Left: Kensington, 2 x USB 3.0, Audio in/ out, DVD burner, Card reader, Smart Card reader, ExpressCard 34/54. Rear: VGA, LAN, HDMI, eSATA/USB 2.0, Power outlet. Right: WLAN switch, HDD slot, 2x USB 3.0, DisplayPort. 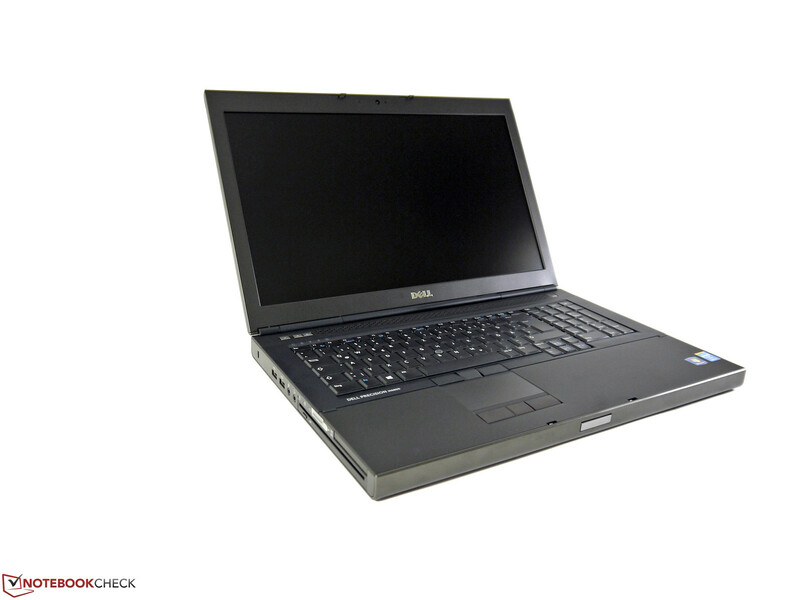 The Dell Precision M6800 is equipped with a Dell Wireless 1550 802.11ac module. It uses two antennas and includes Bluetooth 4.0. We did not find any issues with the connection quality. Furthermore, the antennas for a WWAN module are already included, which makes upgrading quite easy. 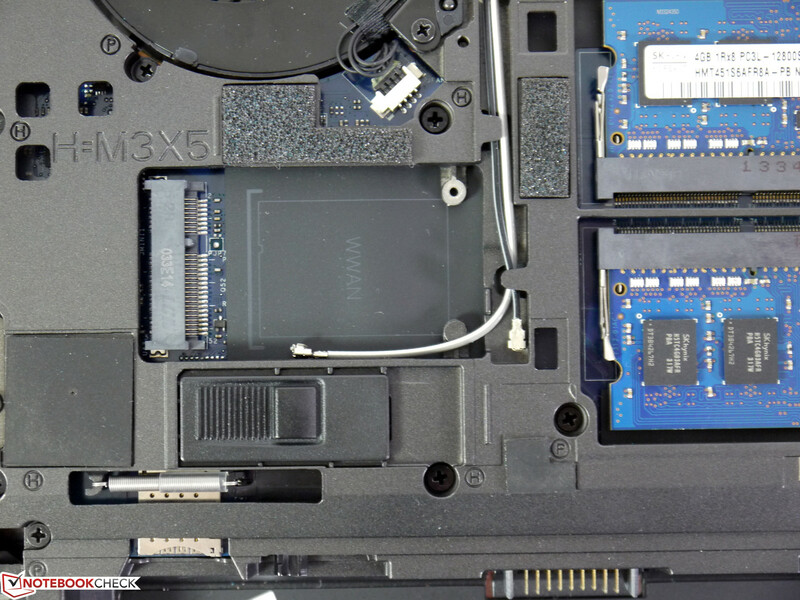 A Crucial M4 mSATA SSD with a capacity of 64 GB was not recognized in the WWAN slot, which seems to be reserved only for mobile broadband use. A Gigabit LAN port and a 720p webcam round off the connectivity. 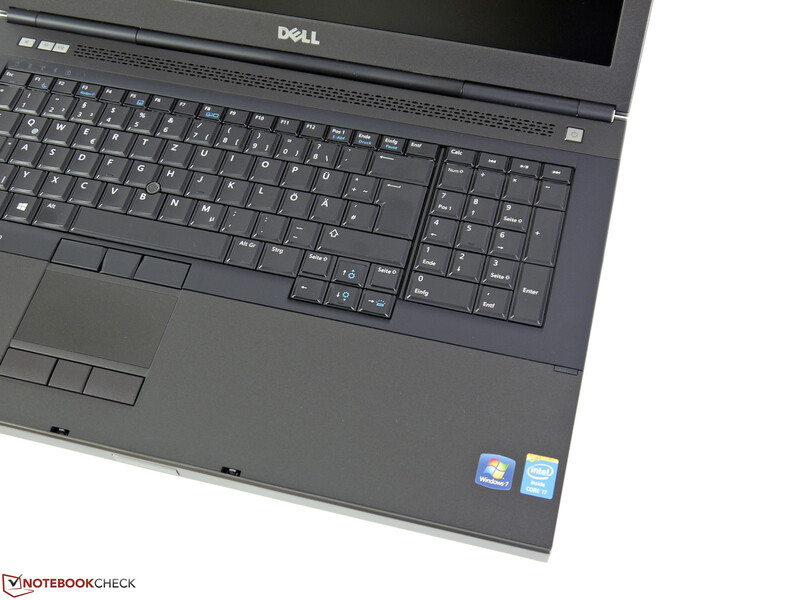 Like in the Dell Precision M4800, the large workstation lacks a fingerprint reader. The pre-configured models available in the online shop do not offer the option of adding one. However, our test model includes a Trusted Platform module 1.2, a Smart Card Reader, various BIOS and system password options and is prepared for the Computrace service. Dell offers a bounty of universal accessories. There are also system-specific docking stations for sale. The Advanced E-Port II port replicator is compatible with the predecessors and costs around 280 Euros (~$376 total) in the shop. The wireless alternative is the Dell D5000 Wireless docking station, which will set the buyer back about 270 Euros (~$363). This may be cheaper, but it includes fewer options and seems only accessible with the Dell 1601 WiGig card. 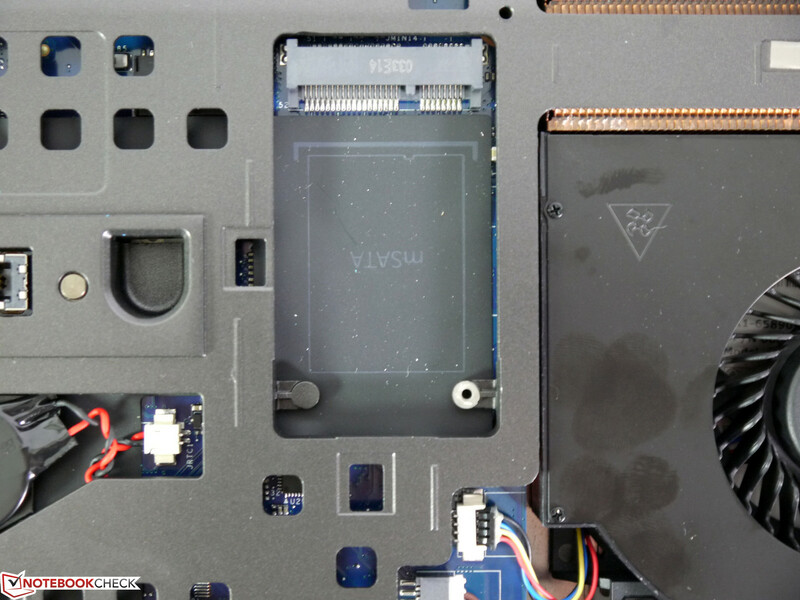 The large maintenance flap on the bottom can be taken off by taking out the battery and removing two screws. Beneath, the user will find all the hardware components and upgrade options. 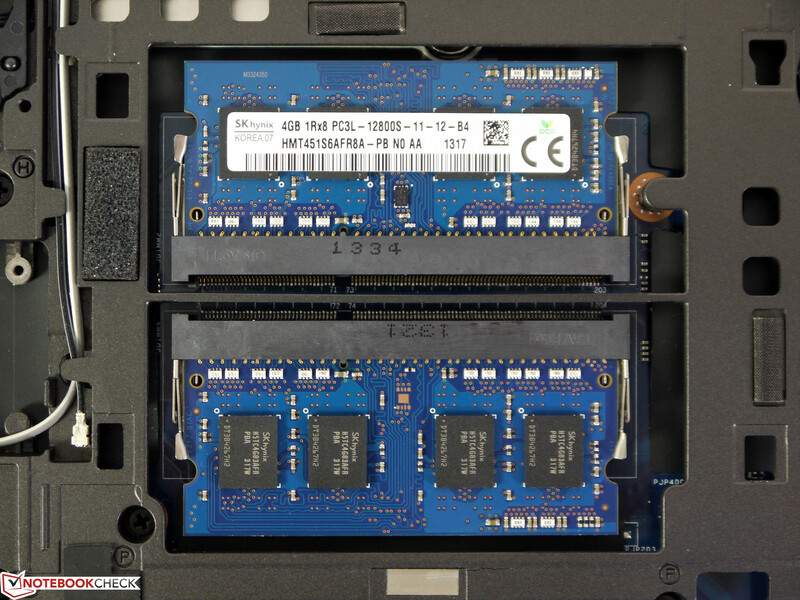 An mSATA slot is unoccupied and can be used to add an mSATA SSD. A second 2.5-inch drive slot offers the user the option of adding a traditional 2.5-inch SSD or HDD. 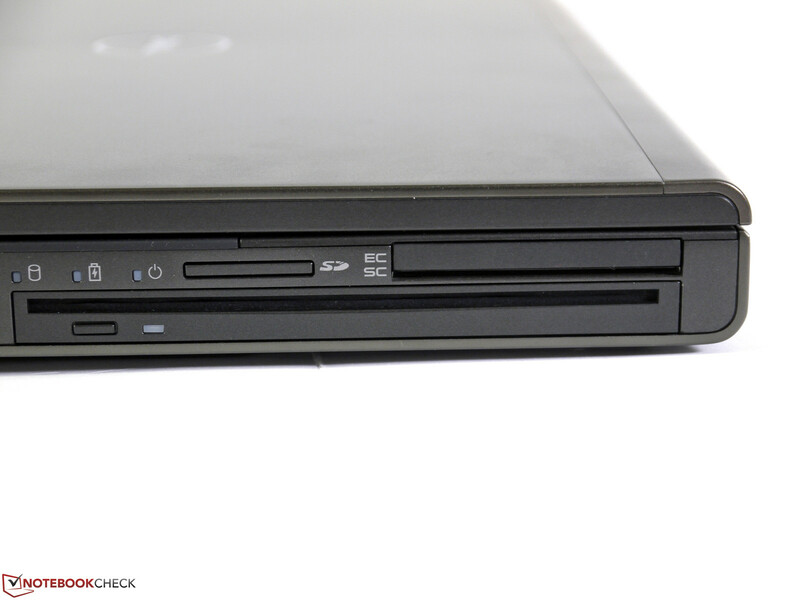 For even more storage, the user can replace the optical drive with a caddy, which will accommodate an SSD / HDD. This design offers the user a plentitude of options to choose from. 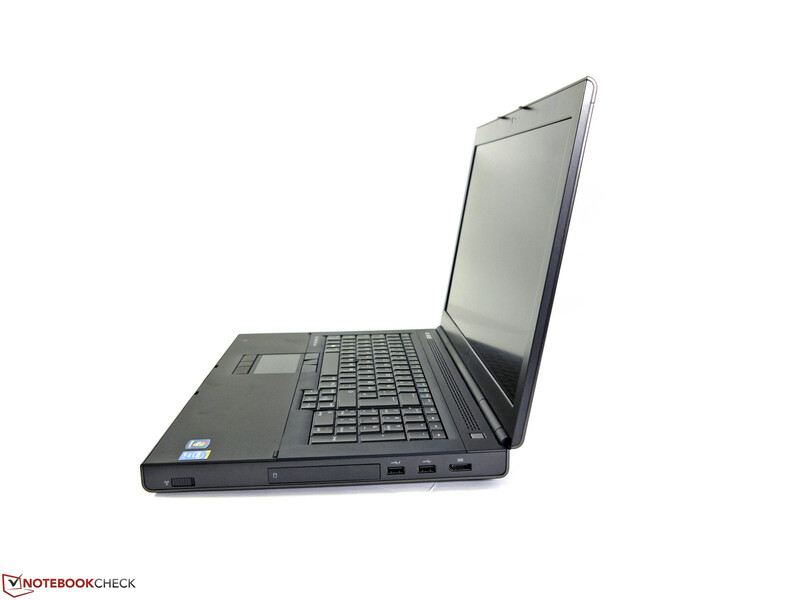 Furthermore, the Precision M6800 is equipped with a quad-core CPU and has four RAM slots. 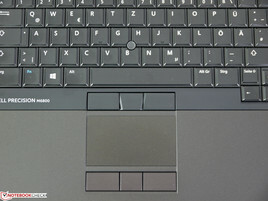 Two of the slots can be found in the bottom while the other two are to be found under the keyboard. In our test model, all four slots are filled with 4 GB RAM modules. 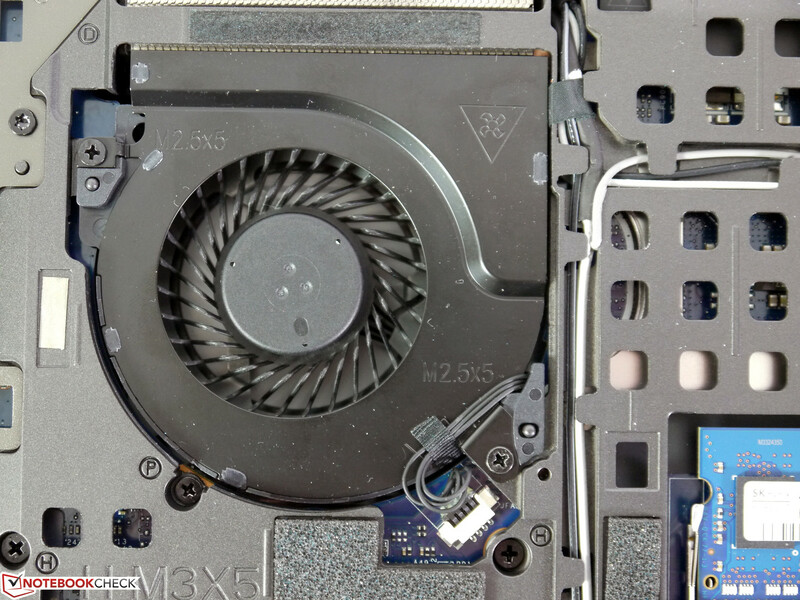 As expected, the fan is easily accessible and can be cleaned / swapped out. 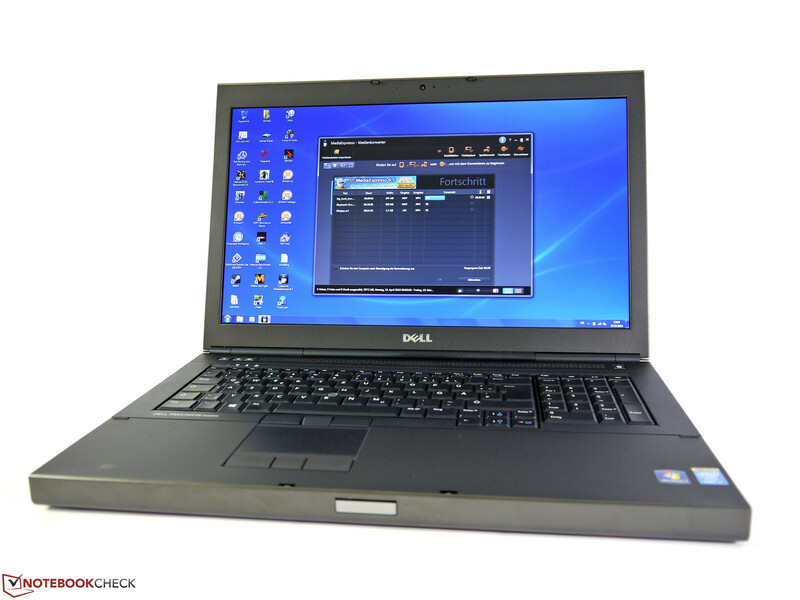 The Dell Precision M6800 includes a standard 3-year basic on-site service on the next workday. Extending the warranty or adding service packets is optional. 5 years ProSupport with on-site service on the next workday will cost the buyer 460 Euros (~$618). 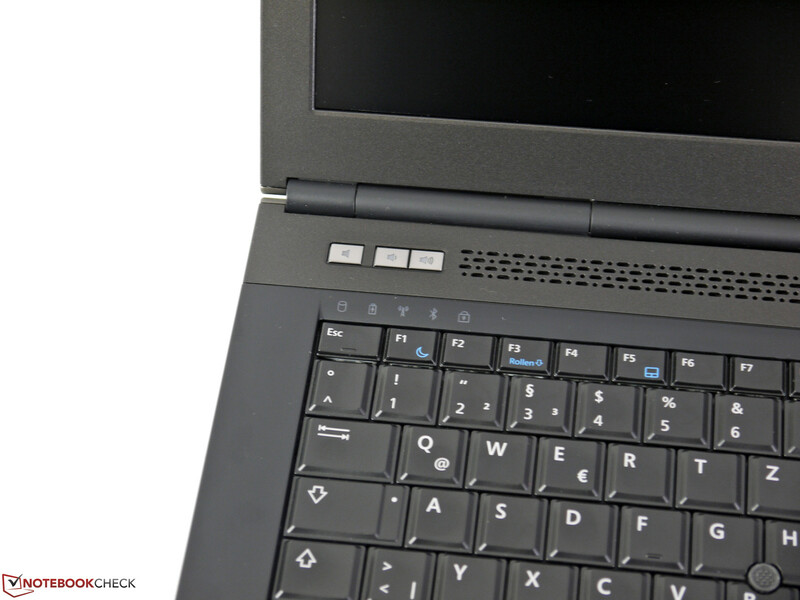 The keyboard is installed securely and offers a modest stroke distance combined with a quiet impact. All keys are sufficiently large and the separate numeric pad should delight number crunchers. 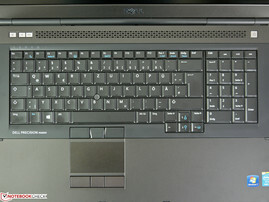 The model even offers keyboard lighting, which is lacking in the Precision M6700. Overall, we believe that typists will enjoy working on this keyboard. The 80 x 45 mm (~3.1 x 1.8 inches) touchpad has very good base properties, but is a bit small for multi-touch gestures. 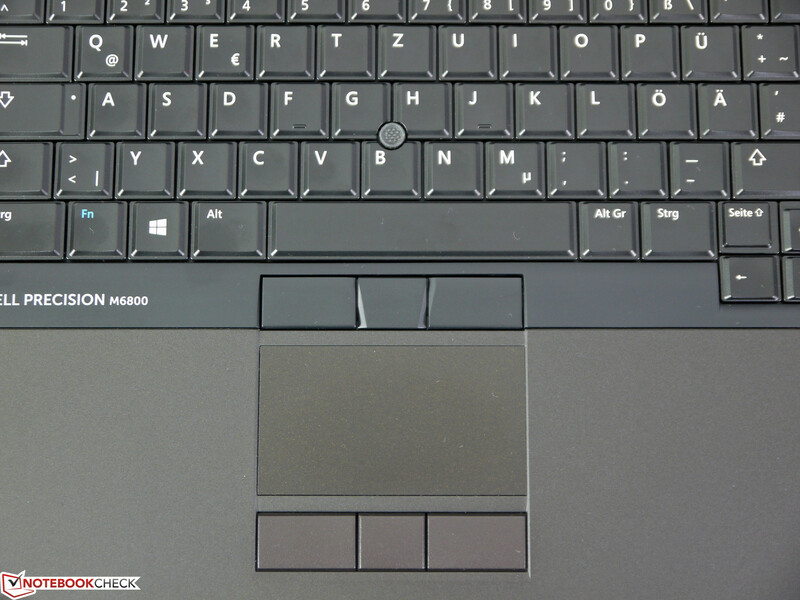 We like the separate touchpad keys, which can be individually configured and the precise TrackPoint. 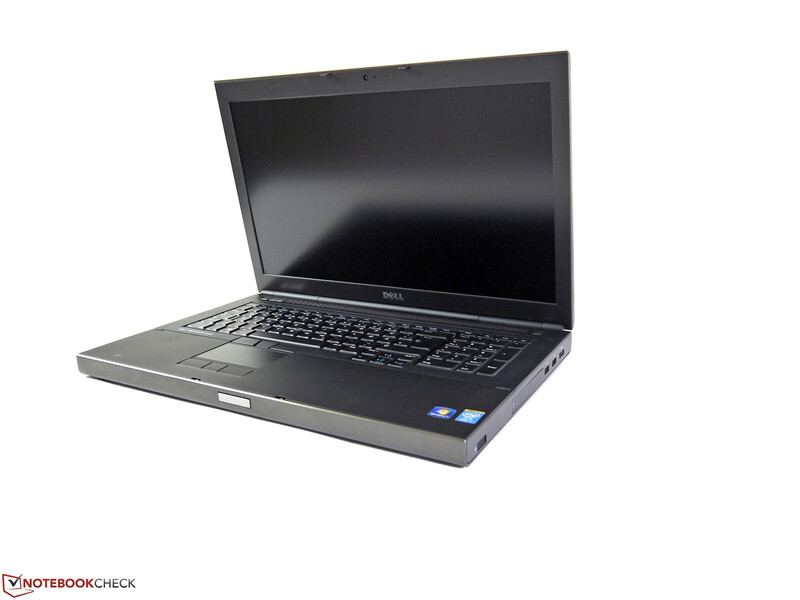 Dell Precision M6800 with a matte Full HD display. Dell offers three different displays for the Precision M6800 workstation. 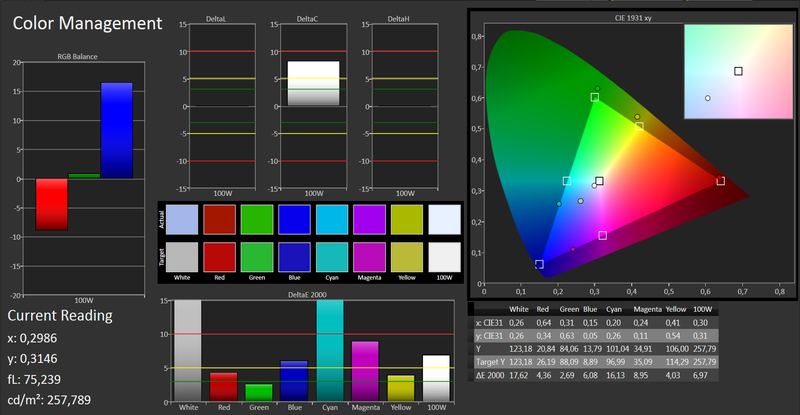 The entry-level model uses a matte HD+ panel with a resolution of 1600x900 pixels. The optional matte Full HD display (1920x1080 pixels) offers a bigger work area with good viewing angles but it also costs more (used in our test model). For users, who enjoy interacting with their laptop with their fingers, the third option, the reflective Full HD display with multi-touch support, is surely the way to go. Up to 10 fingers are simultaneously recognized by the panel and this proves especially useful for Windows 8 users. A display with extremely high resolutions, like a QHD+ panel, is not available for the 17-inch workstation and neither is one with stronger colors like an RGB LED panel. 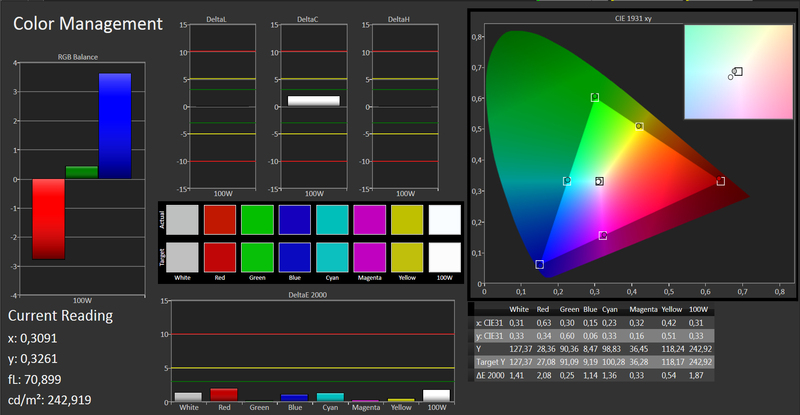 In our test model, we have the same LG Philips panel as in the Precision M6700. The 6700 series also offers a Chi Mei panel, which we thoroughly explored in a test update for the Precision M6700. 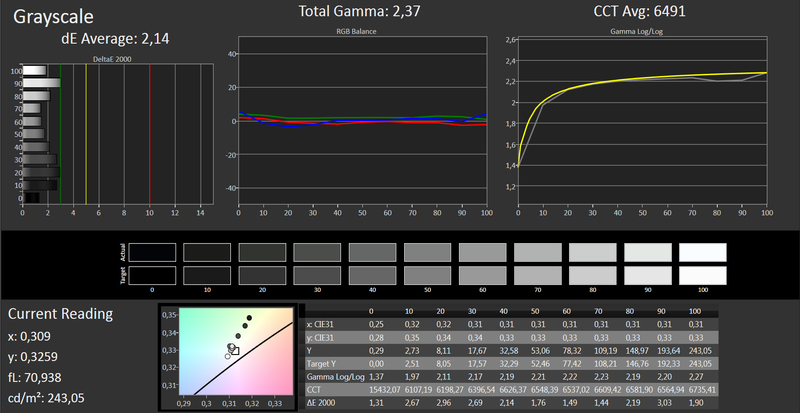 The measured values of our test model are different from those of the Precision M6700 but they lie in the same region. The maximum brightness the Precision M6800 offers is a mere 272 cd/m², but it has an illumination of 83%, which means the brightness varies a little less in different areas. For example, the screen is slightly darker near the top than in the bottom part. However, this is not noticeable to the naked eye and will not affect the user experience. For indoor use, the maximum brightness is more than enough and can even be dropped to 150 cd/m² thanks to the matte surface of the panel. 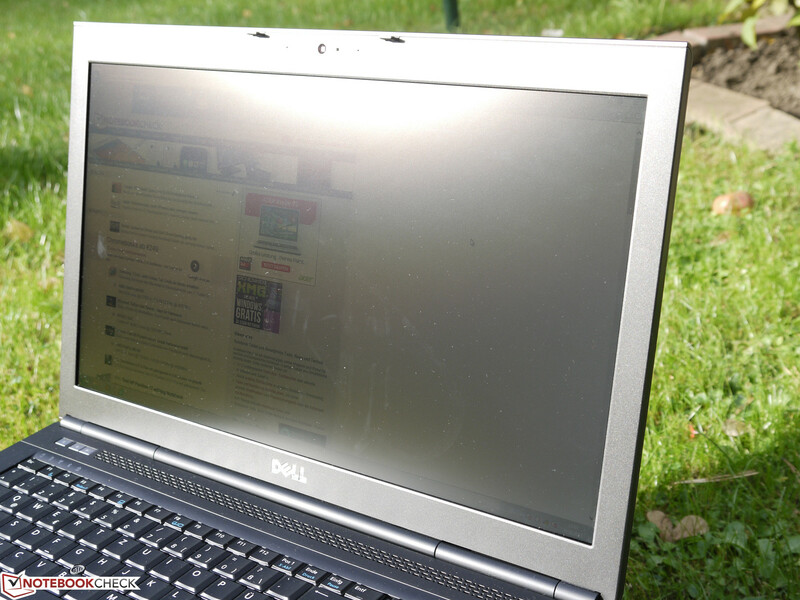 Outdoors, the brightness is not high enough to work with the laptop comfortably. Direct sunlight should be avoided with this full HD panel but thankfully, there are no annoying reflections and the full brightness is available on battery. The measured contrast is 524:1 and it displays more satisfying colors than standard panels. 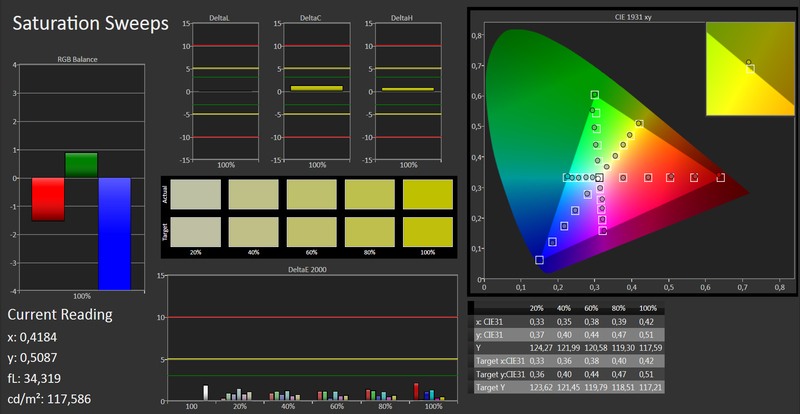 The Chi Mei panel of the M6700 performs better in this section with a contrast of 797:1. 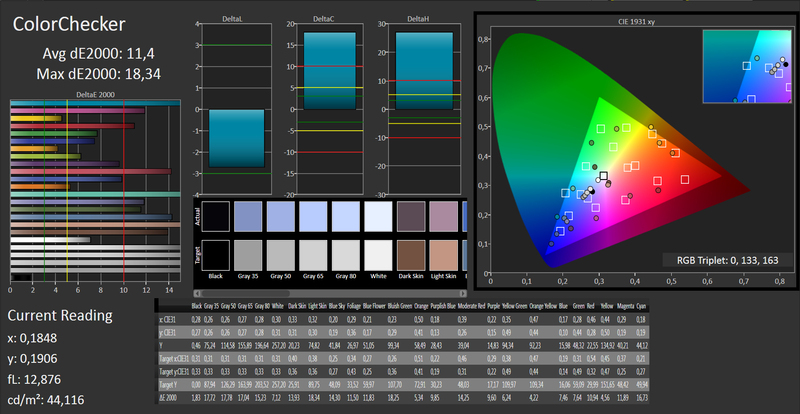 The supported color space is quite close to the sRGB standard but does not cover it completely. While the yellow, green and orange regions are well covered, the blue, cyan and magenta regions are lacking. 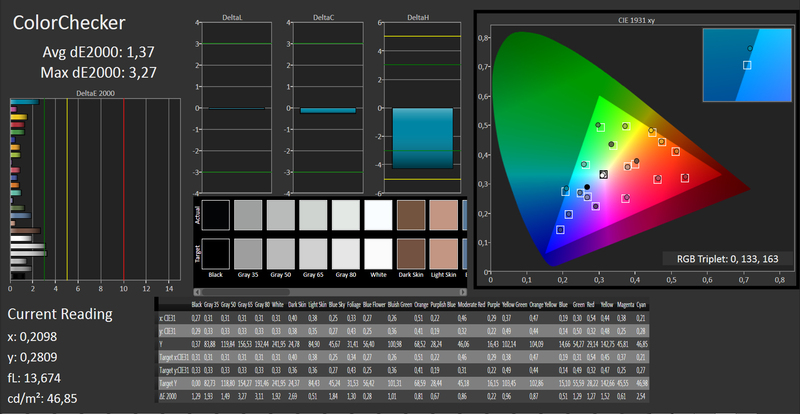 Overall, 90% of the sRGB color space are covered, although the possible colors that can be displayed (over 893,000) are quite close to the figure the sRGB color space offers. The display is not optimally configured. The gray levels, the color saturation and accuracy are far below what one would expect (given what this panel is capable of). After calibrating, all the differences to the ideal values were below a three in DeltaE2000, which means they are not recognizable with the naked eye. 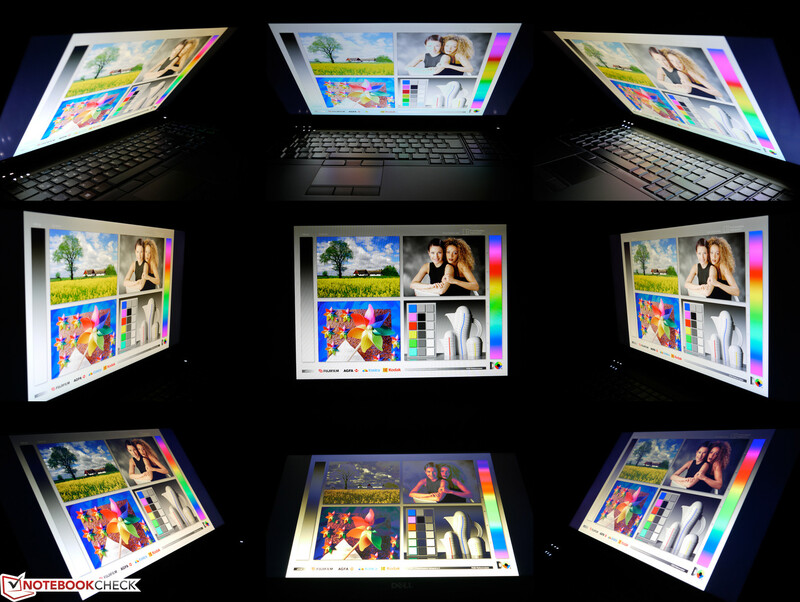 Although the panel does not cover the entire sRGB space, the user can work quite well with the display (especially for photographers, video editors and website designers). The viewing angle stability of the screen is quite good as the colors remain stable at a wider angle than on a standard TN display. However, vertically, the display inverts its colors if it is pushed far back and the colors get bleached out if it is pushed too far forward. At wide angles from the sides or from below, the colors are not as bright and a yellow tinge appears. We noticed a slight blue tinge from above. 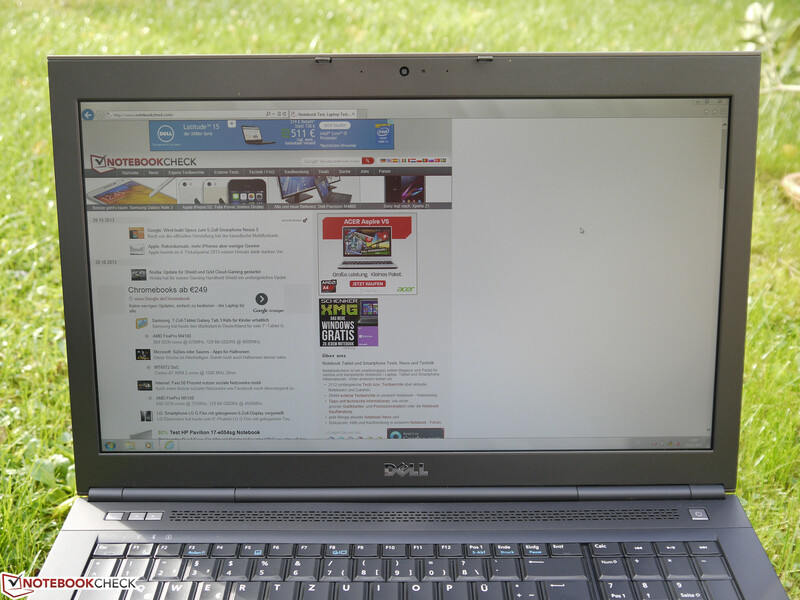 Viewing angles of the Dell Precision M6800 non-glare Full HD. 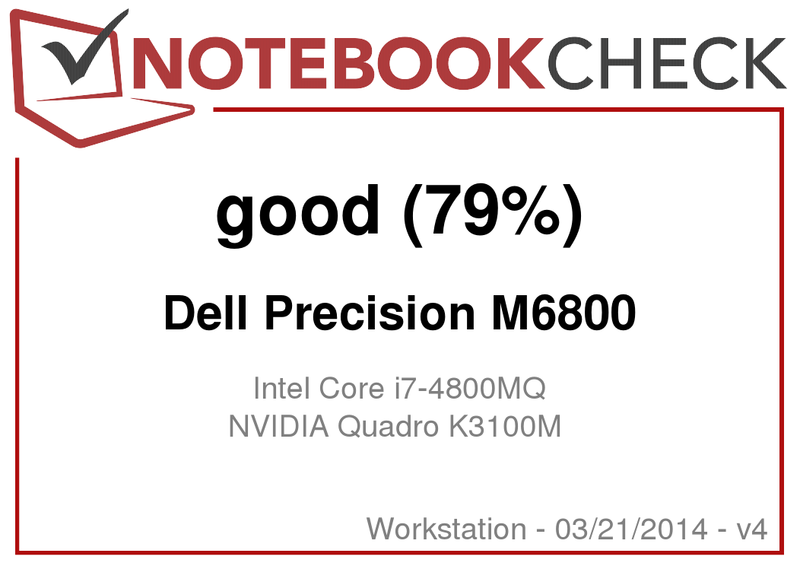 Our Dell Precision M6800 uses a slightly weaker CPU than the Dell Precision M4800 (Intel Core i7-4800MQ) but it can score higher thanks to its stronger professional graphics card (Nvidia Quadro K3100M). Sadly, the test model employs a standard HDD, which will lead to unnecessary throttling of this work machine. Furthermore, the test model does not have an external SSD cache module or a hybrid HDD. We will find out just how much this affects the system performance as the user has to shell out 2,500 Euros (~$3358, total) to buy it. We were surprised to see that the cheaper AMD FirePro M6100 graphics model used a hybrid HDD with an 8 GB SSD cache. 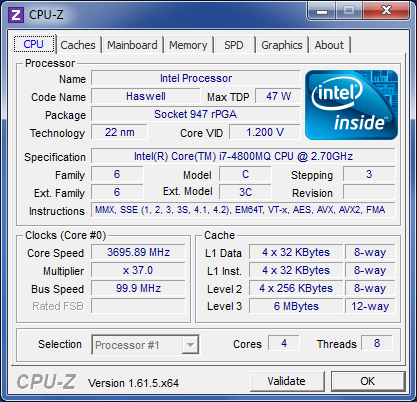 Intel Core i7-4800MQ-CPU (47 Watt TDP) is one of the fastest processors that can be currently found in a laptop. Thanks to Hyperthreading, up to eight threads can be simultaneously processed and thanks to Intel Turbo Boost the single clock speed can be raised from 2,700 MHz to 3,700 MHz. The difference in performance to the Intel Core i7-4900MQ, which runs at 2,800 - 3,800 MHz can be measured but is not tangible in everyday use. 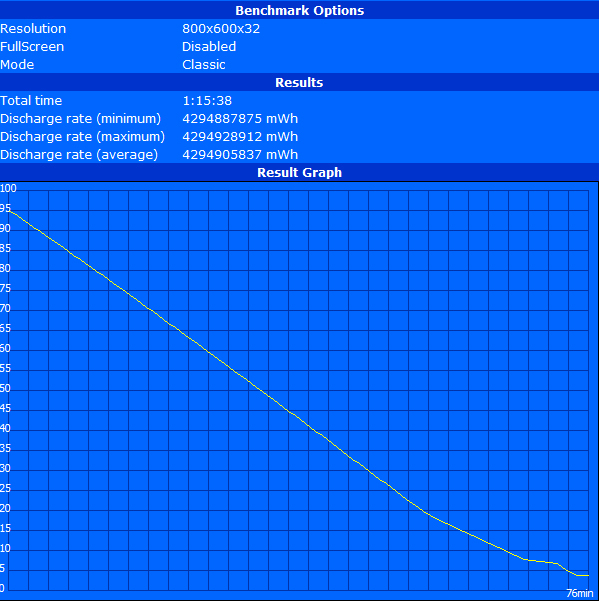 However, the Dell Precision M6800 shows a larger difference than we expected. In the Cinebench R10 64-bit, we measure 6,665 points (single thread) and 21,426 points (multithread), which is quite a bit lower than the 7,112 points (single thread) and 27,537 points (multithread) of the i7-4900MQ in the Dell Precision M4800. This is a much larger difference than we would expect to see as the core clock speed differs by a mere 100 MHz. The Alienware 17 scores much better with the Intel Core i7-4800MQ: 7,051 points (single thread) and 25,111 points (multithread). This is in the region of what we would expect from our test model. 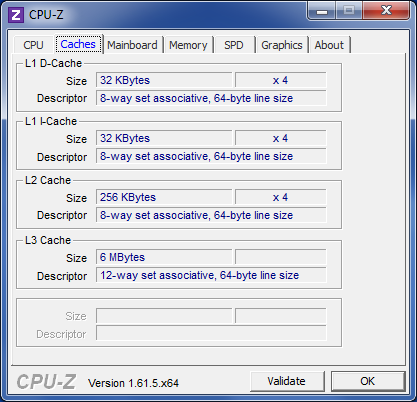 The HWinfo64 tool offers a possible explanation: as soon as the CPU processes multithreaded tasks, the core temperature reaches a constant 98 °C (208.4 °F) and is tagged with the throttling icon. In the CPU load test using Prime95, the clock speeds fluctuate right off the bat between 2.4 - 2.8 GHz (later with FurMark: between 2.1 and 2.5 GHz). We used the "Ultra Performance" profile (max fan levels) for our tests. It appears the cooling system is not capable of keeping the CPU temperature in control. This is a little surprising as the Precision M4800 with the Intel Core i7-4900MQ (47 Watt TDP) and the predecessor the Precision M6700 with the Intel Core i7-3920XM (55 Watt TDP) do not have such problems. We believe that this issue could be limited to our test model or the cooling system is not working as expected. If possible, we will check this again using a different configuration in a test update. In everyday use, the multithreading weakness negatively affects pure CPU processing tasks. For example, although the Cyberlink MediaEspresso can distribute the work load on multiple cores, it requires longer to finish its task on our test model than on the weaker (supposedly) Intel Core i7-3820QM CPU of the previous generation (see image). In iTunes, the processor runs on a single core using its max clock speed of 3,600 MHz and iTunes works up to 57.6x faster. In this scenario, the processor ranks in the expected spot and supports our theory that performance drops only appear in the multi-core tasks. On battery, we did not observe a drop in performance. The test model scores nigh identical points in the above-mentioned benchmarks on battery as with the power adapter plugged in. As previously mentioned, the use of a standard HDD in this high-performance workstation is rather counterproductive (poorly affects the system performance). Although the user has a large storage space for files, the speed is lacking. In comparison to systems that use a Solid State Drive, the user will notice that the system is quite a bit slower, which translates to longer waiting times opening programs and files. As such, the Western Digital HDD is the Achilles' heel of this model and should be replaced as soon as possible (with an SSD or a faster HDD). 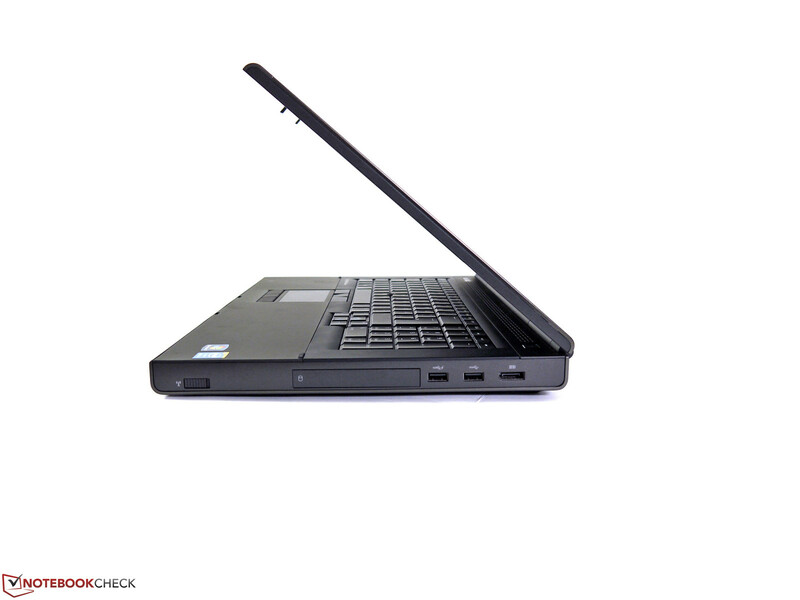 In PC Mark Vantage, the laptop scored a mere 10,904 points and in PC Mark 7, it scores 3,325 points. The traditional HDD from Western Digital offers up to 117 MB/s and has an access time of 15 ms (too high for a workstation). 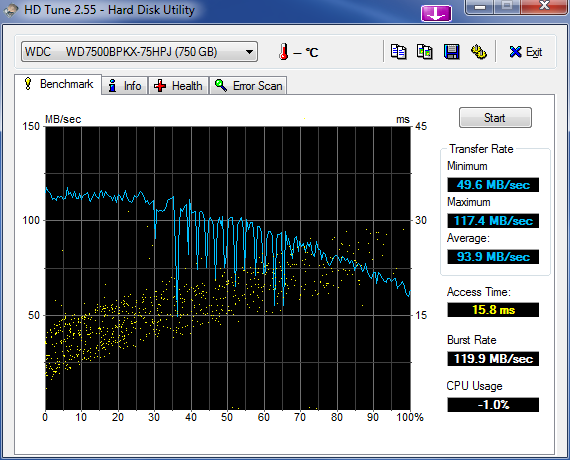 Replacing the HDD with a hybrid storage device or an SSD should improve the performance. 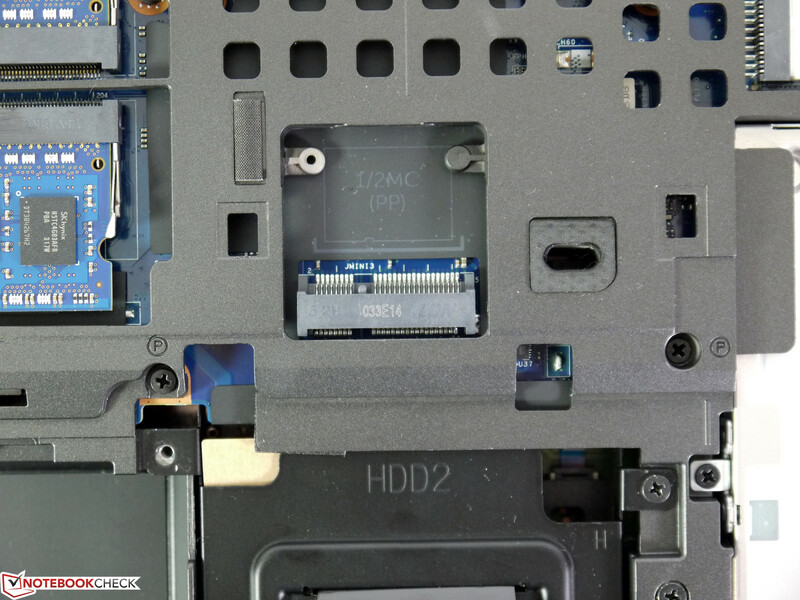 The user is spoilt by the available options: a free mSATA slot (SATA6G), a free 2.5-inch slot (for storage devices) and an optional 2.5-inch optical drive caddy that can be used to insert a HDD/SSD in the optical drive slot. Sadly, the empty slot for WWAN cards in our test model did not recognize our Crucial M4 mSATA SSD and thus cannot be used for storage. 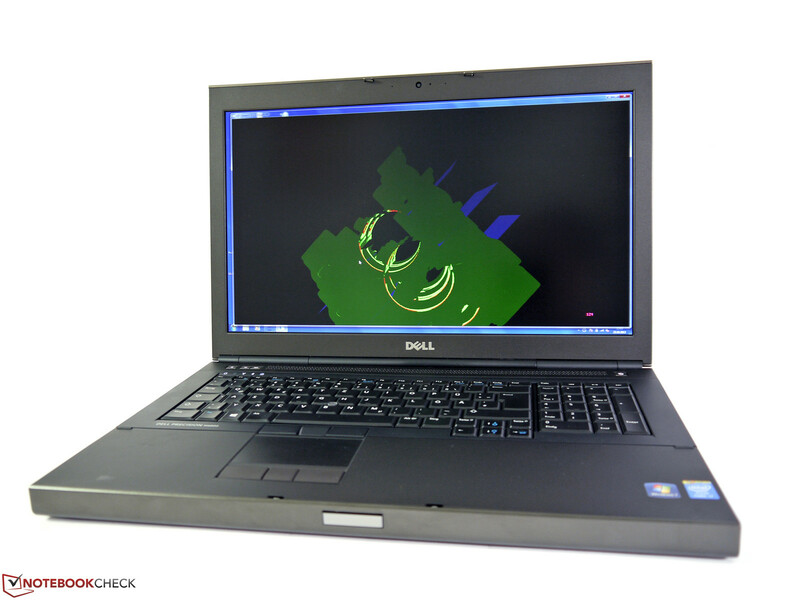 Our Dell Precision M6800 uses the latest Nvidia Quadro K3100M graphics. This card is specifically developed for professional graphics tasks and employs a custom BIOS and optimized Quadro drivers to get the most performance in special programs. 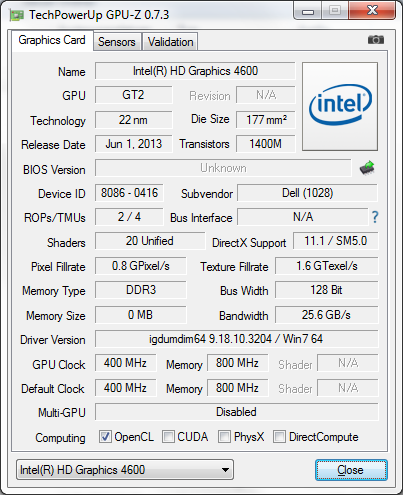 The graphics card has a maximum core clock speed of 706 MHz and is equipped with 768 shaders. The 4 GB GDDR5 VRAM has a 256-bit memory interface and can reach a speed of up to 800 MHz. In comparison to the models of the Nvidia GeForce series, the Nvidia Quadro K3100 will place a little above the Nvidia GeForce GTX 760M in DirectX tasks. In the SPECviewperf. 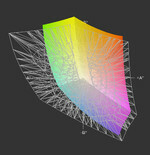 11 benchmark the performance of the graphics card is measured using multiple CAD programs. 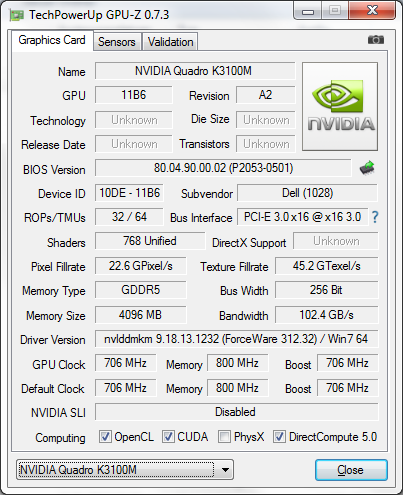 In some test sections, the Nvidia Quadro K3100M can clearly surpass the Nvidia Quadro K2100M of the Dell Precision M4800. However, the graphics card lags behind the Nvidia Quadro K5000M in Ensight and behind the AMD FirePro M4000 in Lightwave due to driver issues. If the user employs the OpenCL interface, the Nvidia Quadro K3100M surpasses the Nvidia Quadro K2100M by a clear margin. We ran multiple tests from the lighting, finance, encryption and video/photo editing categories with a performance plus of 30 - 40 percent. This makes using the K3100M worth the money. The AMD FirePro graphics card provided an even bigger performance increase. In the Raytracing tasks of Luxmark 2.0, the user can see the difference in performance clearly: the AMD FirePro M4000 from the HP EliteBook 8570w of last year can surpass our model by a few hundred percent. The Nvidia CUDA interface and Intel’s Quick Sync video were already tested in the CPU section using Cyberlink MediaEspresso. In standard 3D Mark tests, the graphics card performs great thanks to the optimally configured drivers. The Nvidia Quadro K3100M scores 15,120 points in 3D Mark Vantage and 3,662 points in 3D Mark 11, which is, as expected, a little better than the Nvidia GeForce GTX 760M. However, it cannot compete with an Nvidia GeForce GTX 770M, which has more shaders and higher clock speeds. The Quadro K3100M performs very well in the OpenGL test: 80.75 fps in Cinebench R11.5 OpenGL Shading are hard to reach, even for Crossfire and SLI systems, as shown by our benchmark ranking. 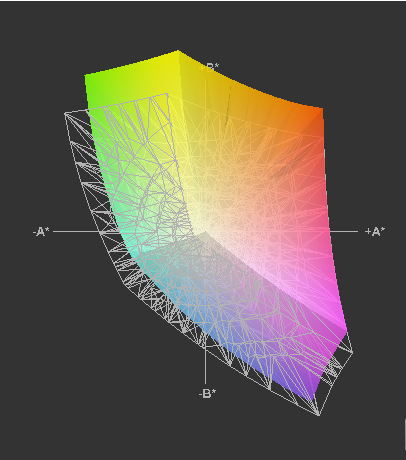 Thus, the OpenGL optimization is great. On battery, the performance of the card drops by three quarters. In Cinebench R11.5 OpenGL Shading, the graphics card scores a mere 22.36 fps instead of 80.75 fps. The gaming performance of the test model is very good, but it cannot run all games at maximum settings. 17 - 25 fps in Tomb Raider, Metro Last Light or Bioshock Infinite at maximum settings are not playable. Lowering the resolution and adjusting the graphics settings improves the game experience. As in the Dell Precision M6700 with the Nvidia Quadro K5000M graphics, we could not use the 1280x1024 and 1920x1080 pixel resolutions. In contrast, external monitors cannot use the standard 1366x768 or 1600x900 pixel resolutions. 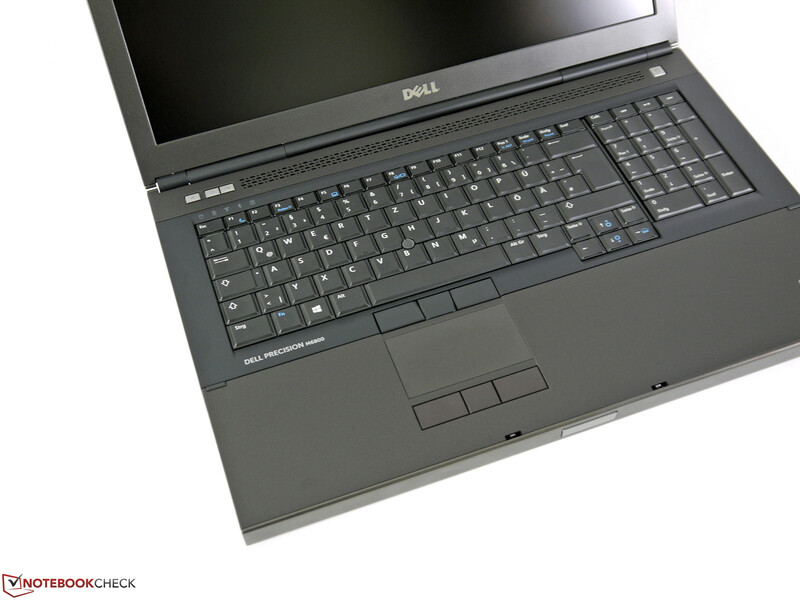 The noise emissions of the Dell Precision M6800 depend on the load. During office, Internet use or photo editing, the workstation remains quiet. 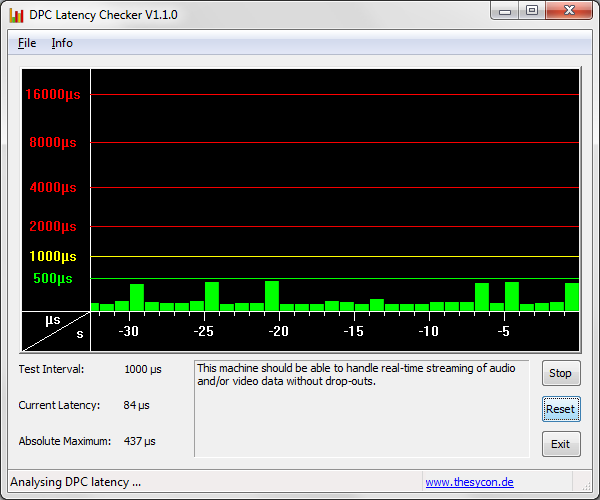 In these conditions, the user can hear the slight rumbling of the HDD at 29.2 dB(A). 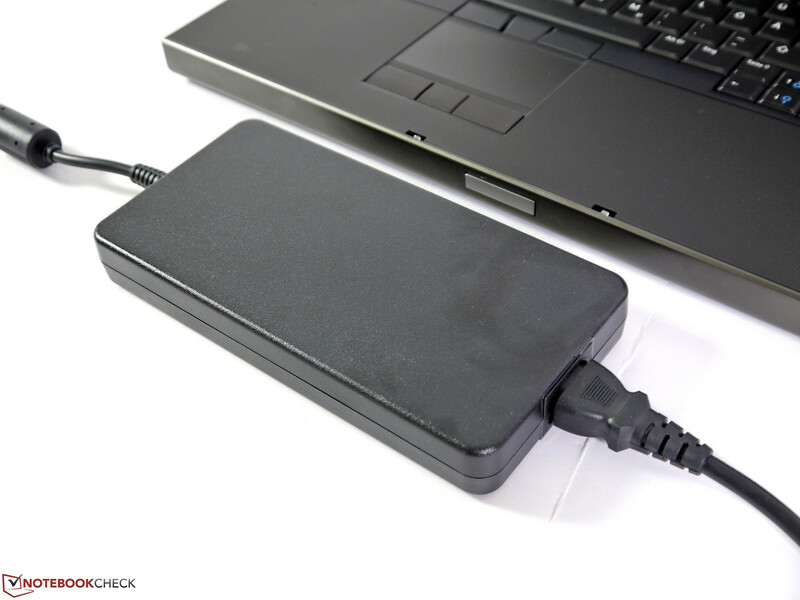 The use of an SSD would make the laptop completely silent. At medium or max load, the emissions can reach a high of 51.3 dB(A). This turbine-like emission is disturbing and will force many users to choose the "Quiet" power profile (reduced fan levels), thereby reducing performance. 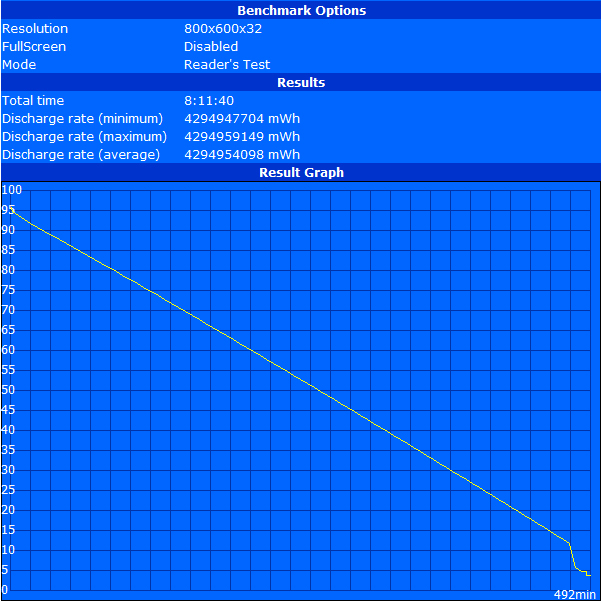 The CPU then runs at a constant 2.3 GHz and the emissions reach a modest 45.2 dB(A). The case temperatures do not exceed the 40 °C (104 °F) level even at full load. 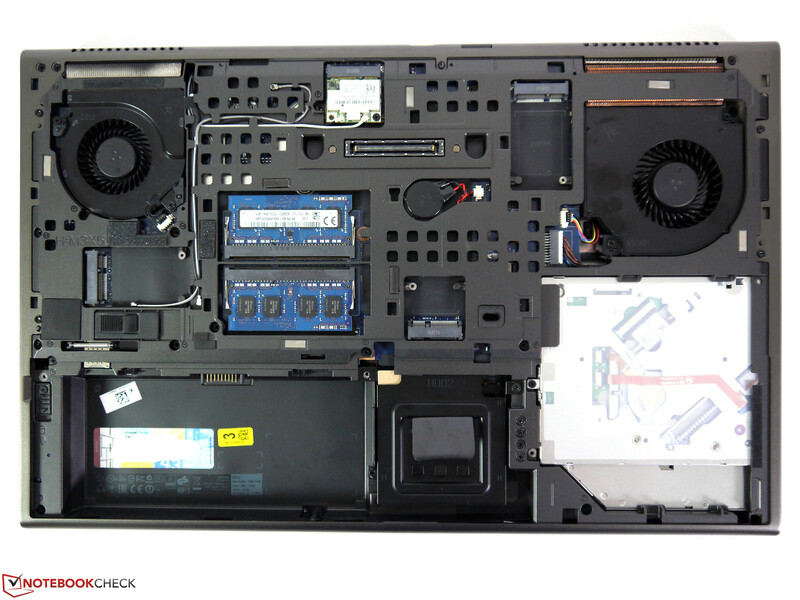 Both fans push the hot air out of the laptop thus keeping the temperatures low. The temperatures near the docking interface seem unusually high: at 47.2 °C (116.96 °F) (like in the Dell Precision M6700), the notebook is clearly hotter in this area than in others. Overall, the temperatures, in comparison to the predecessor, are much lower, especially as the system now requires less power. As such, we can confirm that the cooling system does a good job and has plenty of room for more cooling. (+) The average temperature for the upper side under maximal load is 29.4 °C / 85 F, compared to the average of 31.1 °C / 88 F for the devices in the class Workstation. (+) In idle usage, the average temperature for the upper side is 29.5 °C / 85 F, compared to the device average of 31.1 °C / 88 F.
(±) The average temperature of the palmrest area of similar devices was 27.8 °C / 82 F (-1.9 °C / -3.5 F). The integrated speakers surpass typical speakers found in business notebooks with their balanced sound output. The sound has dominant highs but also offers bass and middles. Presentations in small groups are feasible as the max volume is loud enough for every participant to clearly hear the audio. We like the various volume levels and the separate audio jacks, which allow the user to employ headsets with two jacks. 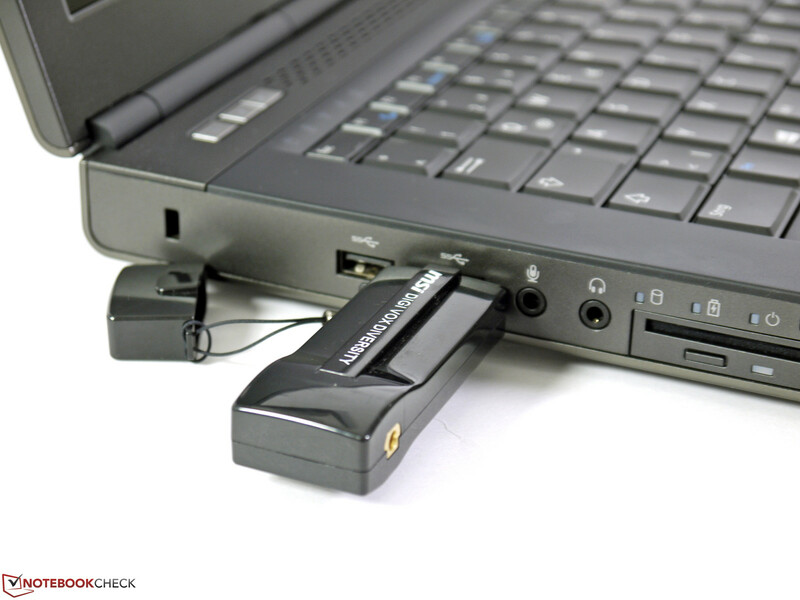 External solutions can be used via Bluetooth, USB, audio jack or HDMI. 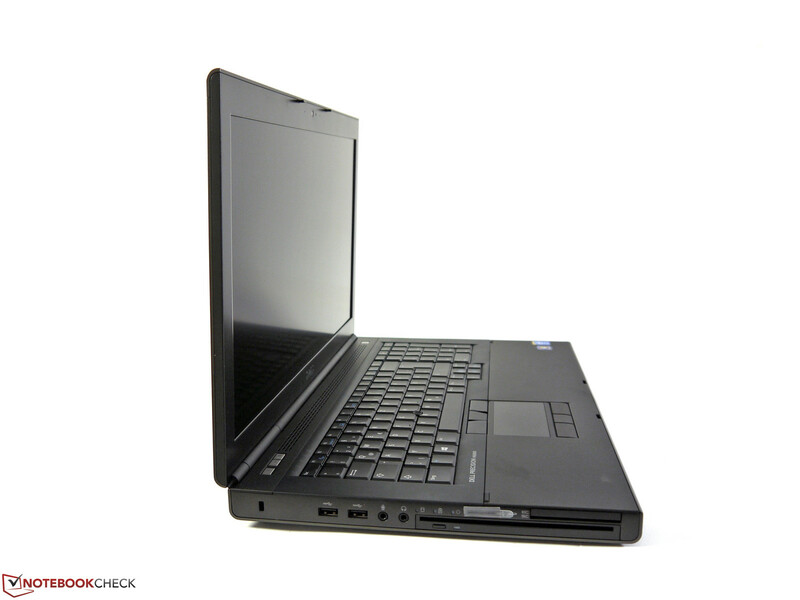 In a past review, we noted a flaw of the Dell Precision M4800: it lacked Nvidia Optimus, which allows the user to automatically switch between the IGP of the processor and the dedicated graphics card. In our test model, this technology is used which allows the power consumption to stay low while idle or at low load. 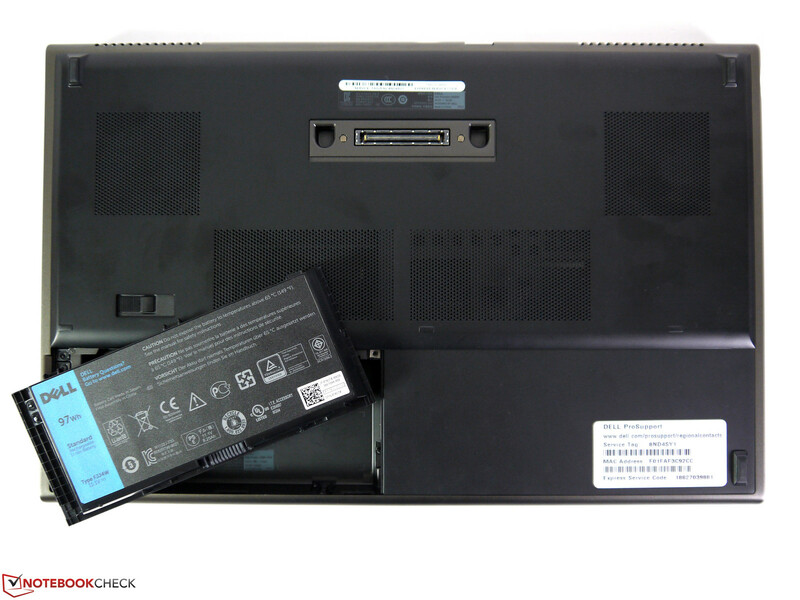 The minimum power consumption of the Precision M4800 was 13.6 W whereas our test model consumes a mere 7.6 W. At medium settings, the model consumes 19.2 W and in "High Performance" (with wireless modules turned on and max brightness) the laptop requires 25.9 W. The difference in this scenario is around 8 W.
At medium and high load, the tables turn: the Precision M4800 consumes less as our test model runs a much more power-hungry graphics card. Our large workstation requires 121.8 W (M4800: 80.2 W) and 141.7 W (M4800: 107.6 W). 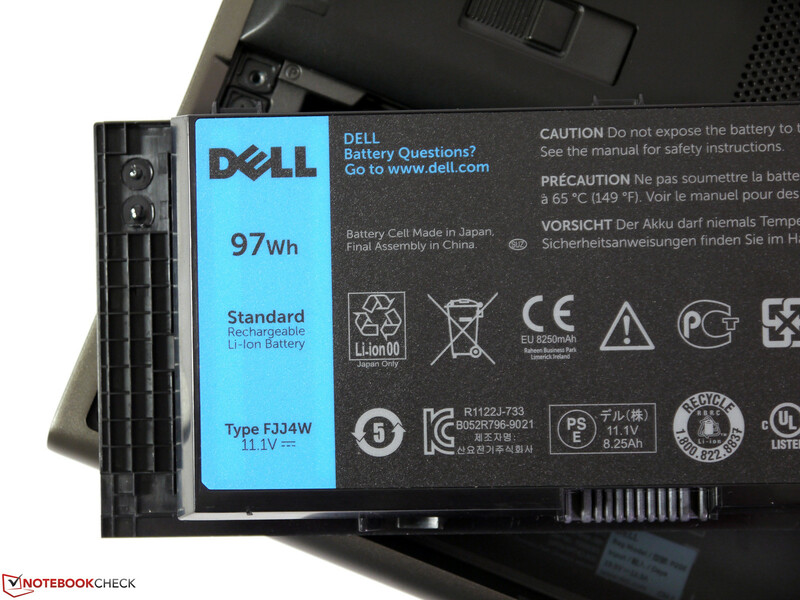 The battery has a capacity of 97 Wh, which is identical and the power adapter offers 240 W delivery. 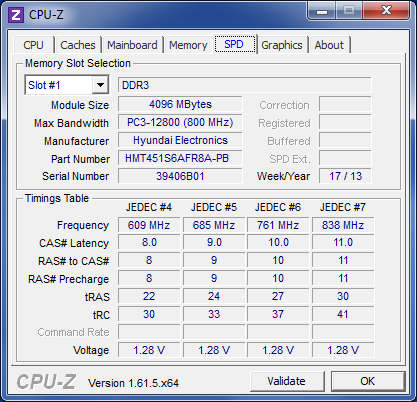 The battery life extends when the Intel HD Graphics 4400 is used. In the Battery Eater Reader’s test (minimum brightness of 31 cd/m², wireless off, "Power Saver" mode, Intel IGP) the Dell Precision M6800 can last over 8 hours without being plugged in. While surfing the Internet using WLAN (147 cd/m² - brightness level 8, "Power Saver" mode, wireless modules on), the laptop can last 6 hours. The user can play movies using DVDs for up to 5 hours (max brightness, wireless off) and the full load scenario in Battery Eater Classic test (max brightness, "Ultra Performance", everything on) can be run for about 2 hours. This relatively long run time at full load is thanks to the automatic reduction of the graphics performance to one-fourth of its power. 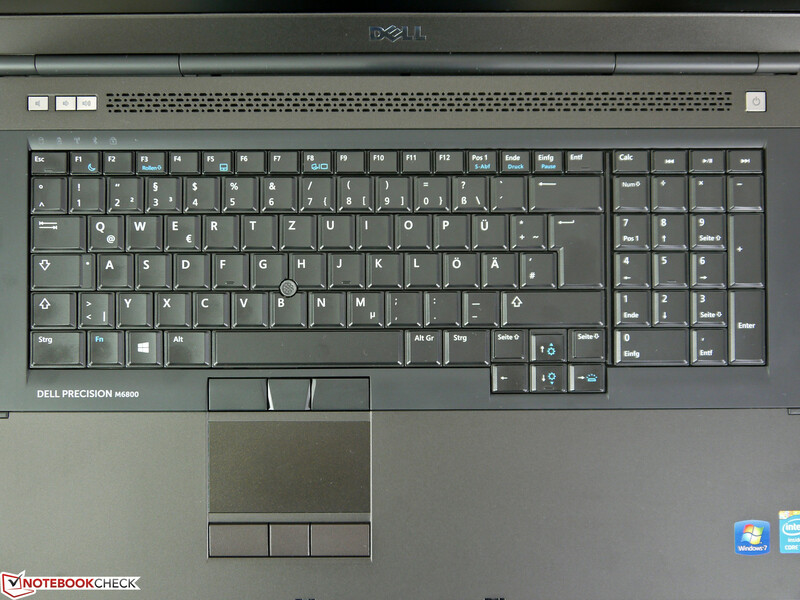 The Dell Precision M6800 is a step in the right direction: the case, keyboard and connectivity are very good and remain solid pros for this series. The upgrade and maintenance options, support and warranty packets as well as the extensive accessories catalog are further pros. 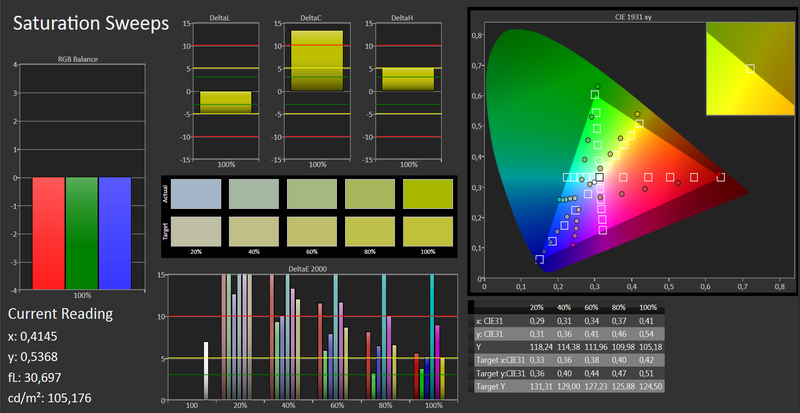 The test model uses a Full HD display, which has nice properties such as accurate color depiction (for professional work). 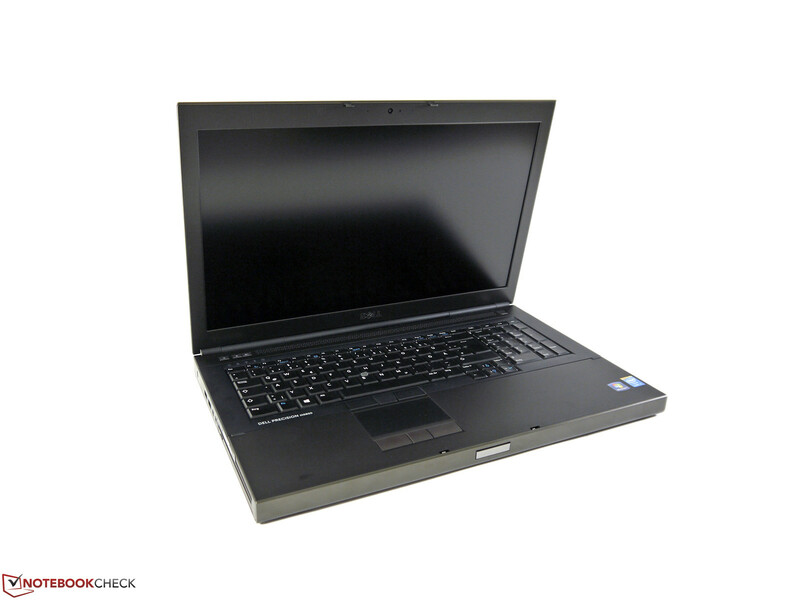 Although the relatively heavy Dell Precision M6800 is not ideal for mobile work, it has good battery life thanks to the switchable graphics, which allow the laptop to run 2 - 6 hours. Overall, the performance during normal use and in CAD is very good, but the CPU performance is decidedly weaker due to its multithread weakness. 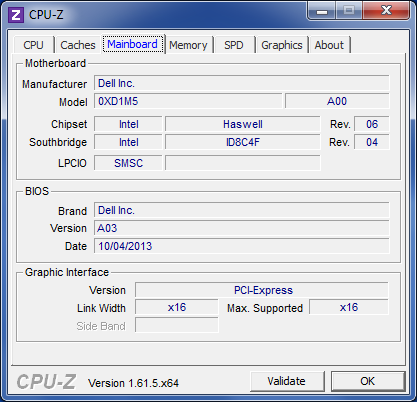 This is noticeable in benchmarks as well as in programs that utilize multithreading. Although we believe this to be a problem limited to our test model, the limited configuration options for the private users and the relatively high pricing are additional cons that will affect the purchase decision. 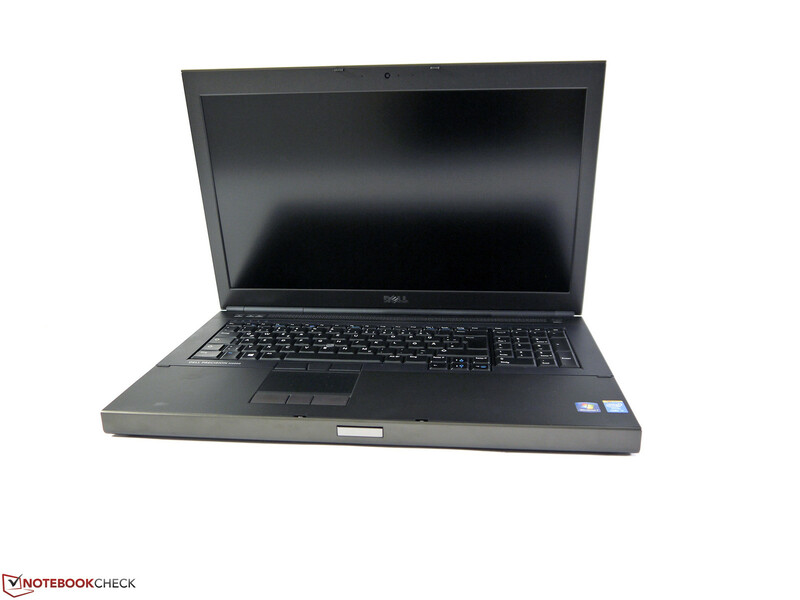 The Dell Precision M6800 is a large yet mobile 17-inch workstation. ... great performance with CAD, DCC, medicine, geographic survey and imaging tools. The large case offers a multitude of configuration and upgrade options. Furthermore it is a good base for a powerful cooling system. 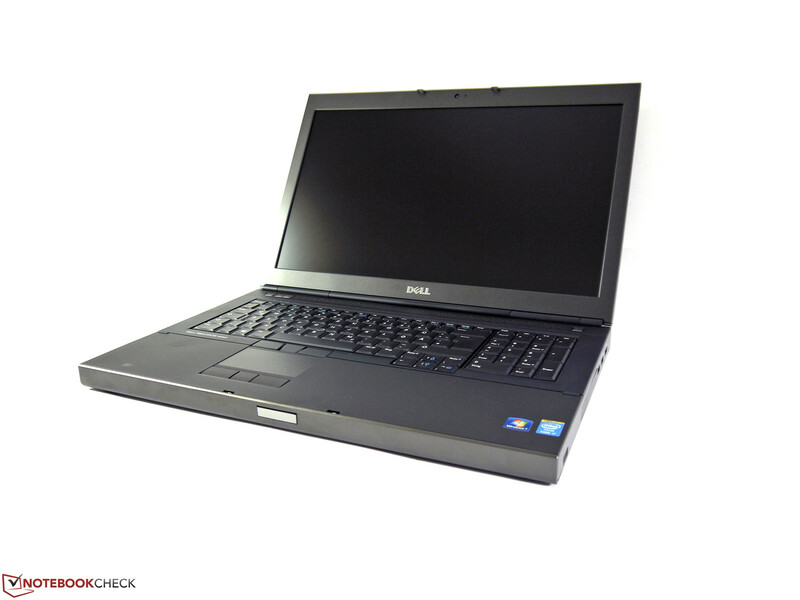 ... in comparison to the Dell Precision M6700. ... but thanks to this it offers a remarkable sturdiness and build quality. The modest mobility is balanced out by the good battery life. The cooling system has two fans which provide ventilation for the CPU and GPU. 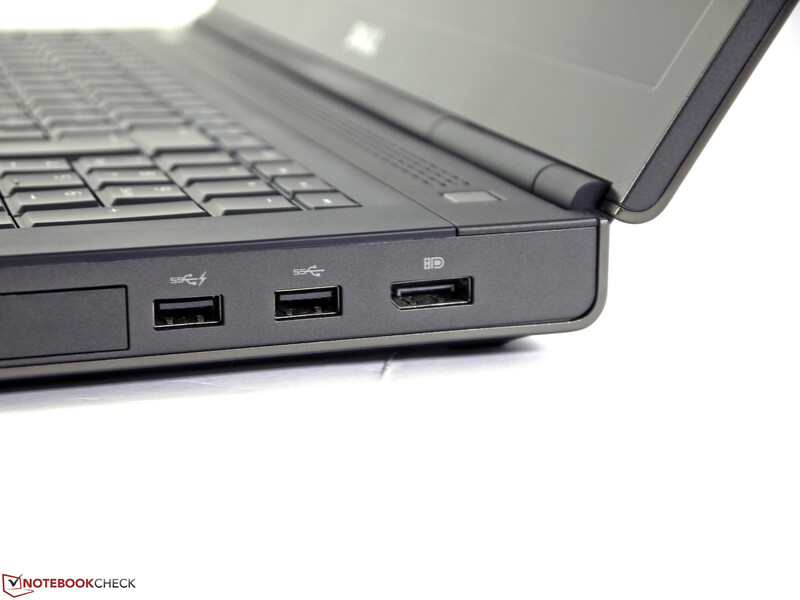 Multiple ports are placed near the back of the laptop. The sides accomodate even more and these are placed in relatively practical positions. The area around the optical drive looks a little narrow. ... and the display hinges hold the screen in position. Webcam, microphone and hook clasp. The primary storage drive can be taken out from the side. HDMI, DisplayPort and VGA provide video output to external monitors. The gaps between the ports should have been larger. Wide sticks can block neighboring ports. ExpressCard/34 or ExpressCard/54 allows the user to add ports. A 240 W power adapter is provided. The battery has a capacity of 97 Wh. 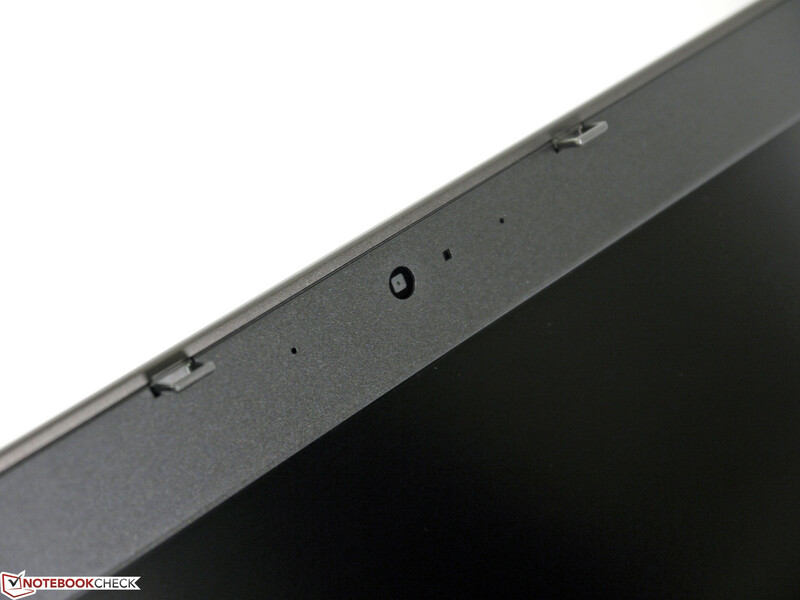 The bottom of the laptop looks well-designed. 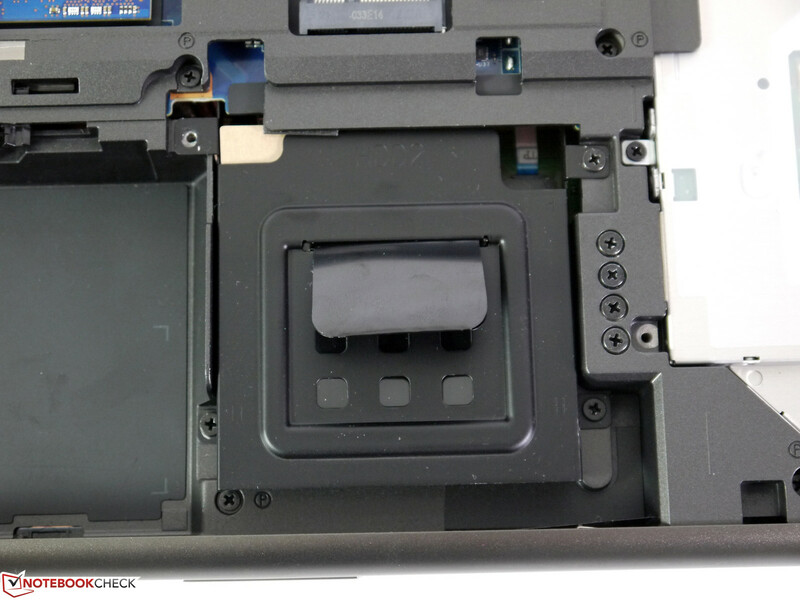 The SIM card is inserted in the battery slot. 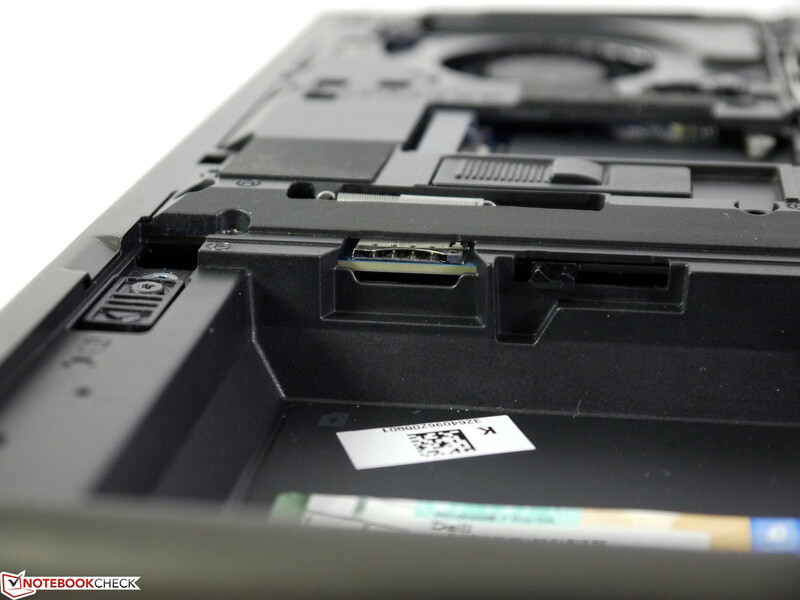 A second hard disk slot offers space for another SSD or HDD. The preparations for a mobile broadband module have already been made. An mSATA SSD can also be installed. WLAN and Bluetooth 4.0 are on-board. The cooler fan can be easily cleaned or even swapped out. A free slot with half width is available. 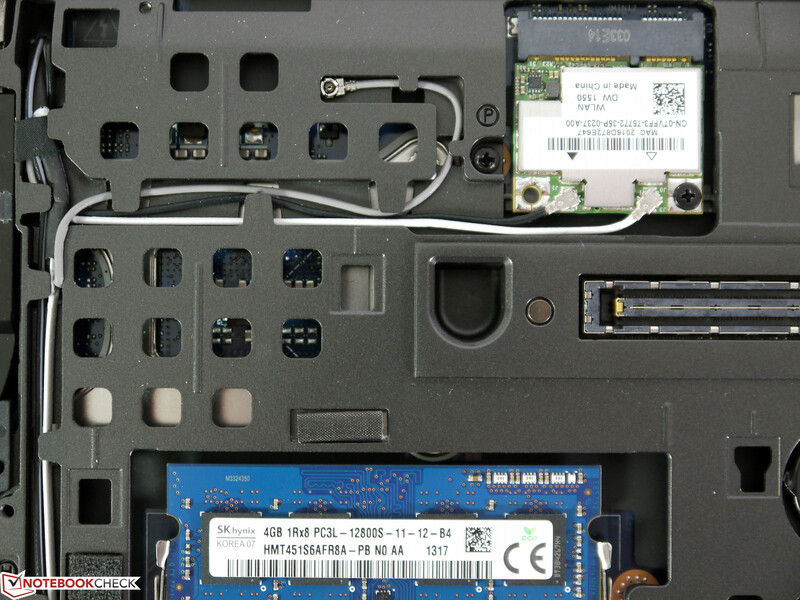 Two RAM modules can be found in the bottom of the laptop while two more are hidden below the keyboard. The docking port has stayed the same, which means it accepts the older stations as well. The combination of low emissions, high performance and solid business qualities. A fingerprint reader, better multithread performance and more customization options for private users. A more detailed product description would also be nice. There is no option for a QHD+ display for this 17-inch model. We were also surprised that the test model used a traditional HDD. 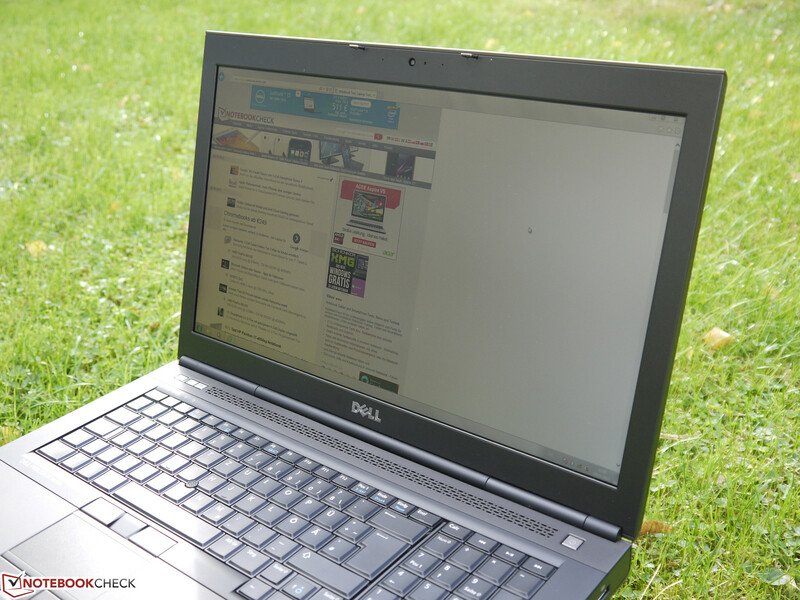 From this year, we have only tested the Dell Precision M4800. The new Lenovo ThinkPad-, HP ZBook-, Toshiba Tecra- and Fujitsu Celsius workstations are going to hit our test benches soon. 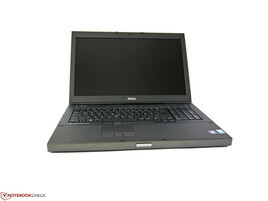 Perhaps the buyer might find a good deal amongst the predecessors: for example, the Dell Precision M6700, the Fujitsu Celsius H920 and the HP EliteBook 8770w.